Our offices are open 9am to 5pm Eastern time. Telephone: (301) 652-5800 | Fax: (301) 652-8035. Current Subscribers: Having problems viewing your digital issues report your problem here. Use the dropdown below to help us direct your question. What device(s) are you accessing Genii on? Digital + Print Subscriptions available, or digital onl, starting at $58. Adding To (vs. 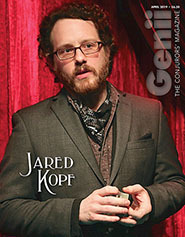 Taking Away From) Biddle in "Left Handed"
Be a part magic's oldest independent and largest magazines. Subscriptions start at only $35 a year. 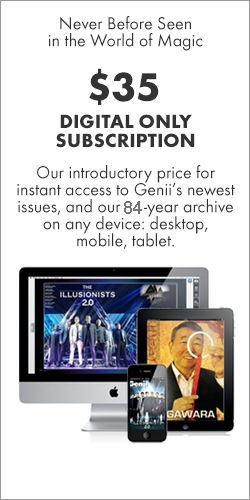 Visit your local magic shop and ask for Genii, or try a demo of our Desktop Reader. NEED TO SWEETEN THE DEAL? 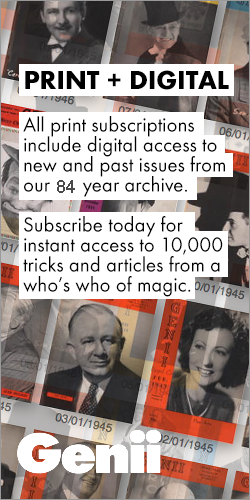 We offer a number of special offers and add-ons for subscriptions, including big fat magic books. 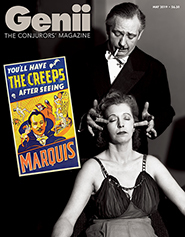 GENII, THE CONJURORS' MAGAZINE Founded in 1936 by William Larsen, Sr. 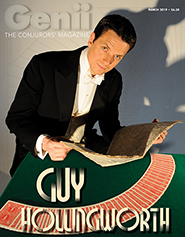 Published and Edited since 1999 by famed author Richard Kaufman, it is the largest-selling and most highly acclaimed magic magazine in the world. Everyone reads Genii. © 2018 Genii, The Conjurors’ Magazine, The Genii Corporation.